Fisher Price Motion Control Thomas Just $15.97! Down From $48! You are here: Home / Great Deals / Christmas Deals / Fisher Price Motion Control Thomas Just $15.97! Down From $48! 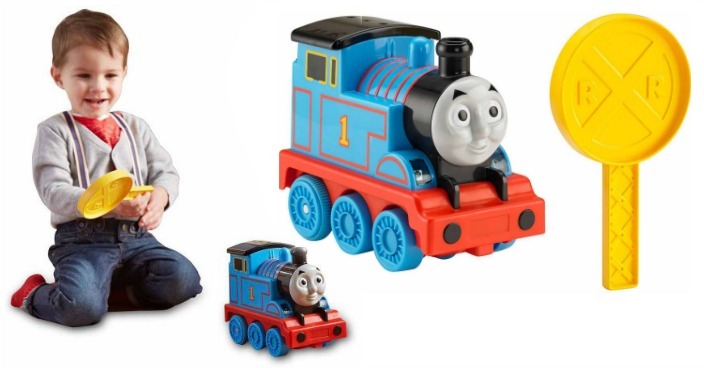 Right now you can get this Fisher Price Motion Control Thomas for just $15.97 (Reg. $48) at Walmart! Motion Control Thomas from Fisher-Price lets you control the No. 1 blue engine with just a wave of your hand! Simply slide the power button to the “on” position, press Thomas’ dome to activate him, then wave your hand over his roof to send him on his way. You can also direct Thomas by waving the included crossing sign for a true railway experience! Thomas will move forward, backward, rev for racing, and avoid obstacles by reversing and turning — all at your command! Wave forward to send him forward, or wave back to send him backward.